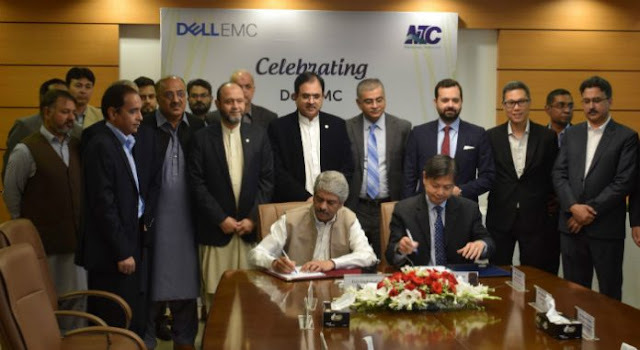 As per Government of Pakistan’s vision about “Digital Pakistan”, National Telecommunications Corporation (NTC) has signed a MoU with Dell EMC to build their digital future, making Dell EMC the solution provider for NTC’s data center infrastructures in Pakistan. Dell EMC enables enterprise customers to achieve successful IT and digital business transformation through the use of trusted hybrid cloud and big data solutions that are built on a modern data center infrastructure, on top of industry-leading converged infrastructures, servers, storage, and cybersecurity technologies. Under this partnership, NTC will work closely with Dell EMC to adopt a new generation of infrastructure that will facilitate the strategic launch of NTC’s Datacenter-as-a-Service offerings, aimed at government customers and their unique needs in Pakistan. This will also enable NTC in its adoption of the new generation of Infrastructure through enrollment as a Datacenter-as-a-Service provider. Speaking on the occasion, Mr. Viqar Rashid, MD NTC expressed that NTC’s determination to serve all Government Sectors institutions will achieve another milestone and NTC is heading one step closer to offer best solutions with the latest technologies and infrastructure. We are confident that Datacenter-as-a-Service offerings will facilitate greater innovation and improve citizen engagement.